Our philosophy and specialties from our kitchen. Our kitchen team will spoil you with national and international dishes or with lovingly prepared regional specialties. We only use fresh, high-quality products such as our homemade cereals, and we only offer the best regional produce from local farms, as well as local game such as our famous venison salami. 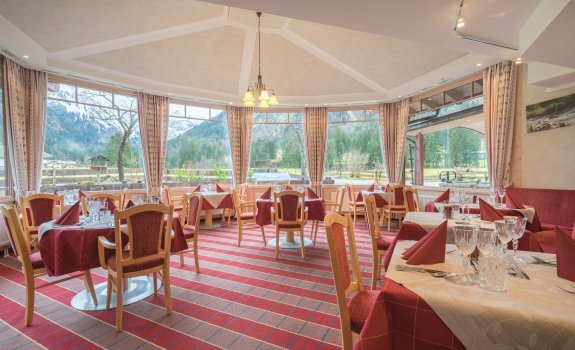 No matter which of our restaurant areas you choose for your snack or meal, you will always be able to enjoy terrific panoramic views of the main crest of the Allgäu Alps. Mornings from 7:30am to 11:00am you can enjoy our breakfast buffet in cozy parlors or, during the summer season, on our beautiful terrace with its mountain views. Treat yourself to a rich buffet with crusty breads, fresh cakes, regional cheese and sausage specialties, egg dishes, homemade spreads, fresh fruit and vegetables, juices, coffee and tea. Try our homemade Birgsau muesli for an energetic start to your day. Round off an enjoyable vacation day in the Birgsauer Hof restaurant between 5pm and 11pm (hot food served until 8:30pm). 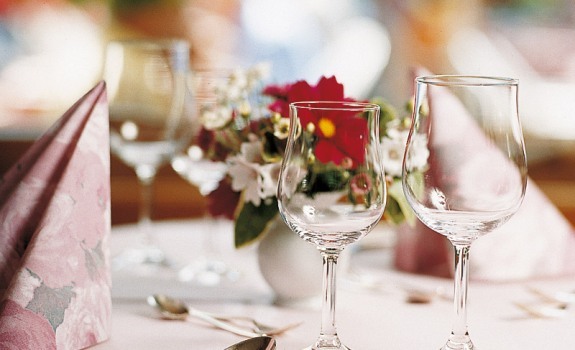 Get pampered by a 4-course meal and seasonal salad buffet. We will also be pleased to serve you with a wide selection of à la carte regional dishes such as our game specialties. 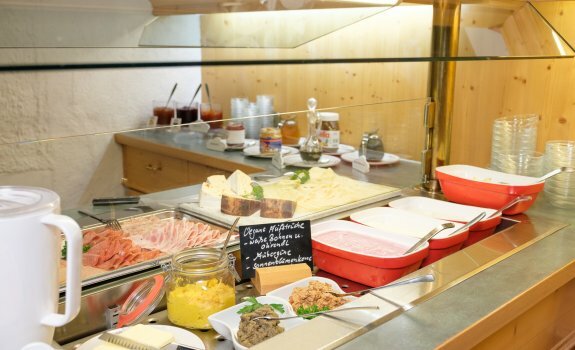 Your day will begin with a highlight: breakfast with fresh products, homemade cereals, local cheese and sausage specialties, egg dishes, homemade vegan spreads, fresh fruit and vegetables, juices, coffee and tea will leave nothing to be desired. After an exciting day in Allgäu your evening will get culinary. Just as day begins at the Birgsauer Hof it can also end with culinary delicacies in the form of a 4-course meal and a buffet with crisp, colorful salads of the season. Get spoiled by our delights! Pure pleasure in the Birgsauer Hof. Our tip for all those who wish to enjoy their holiday completely carefree. In addition to half board with breakfast and dinner, you can also enjoy all non-alcoholic beverages at no extra cost (soft drinks, juices and spritzers, coffee specialties and tea) from 7:30am to 5:30pm. At lunchtime, you will be served a small but delicious lunch buffet with salads, bread, cheeses, cold cuts, vegetables and a hot dish or soup. Between 2pm and 5pm delicious cakes and fine tarts will be available. After a nice hike you can enjoy a cake and cappuccino on our sunny terrace with its view of the mountains, for example.